The CDC is reporting that at least 539 people are now sickened in the nationwide Cyclospora outbreak. Thirty-two people have been hospitalized. The outbreak has now spread to 19 states and New York City. The case count by state is: Texas (215), Iowa (153), Nebraska (86), Florida (27), Wisconsin (14), Illinois (9), Arkansas (5), New York City (5), Georgia (4), Missouri (4), Kansas (3), Louisiana(3), New Jersey (2), Ohio (2), Virginia (2), California (1), Connecticut (1), Minnesota (1), New Hampshire (1), and New York (1). Some of the cases were acquired in different states, and there is one that may be a travel-associated case. Most of the illness onset dates are from mid June to mid-July. The number of cases reported each day is slowing, following the epi curve. Additional cases are under investigation and will be included as soon as they are confirmed. 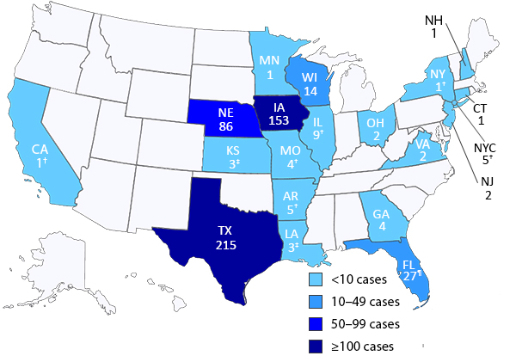 To date, the CDC has confirmed 42 cases of cyclosporiasis in the CDC laboratories. The outbreak in Iowa and Nebraska has been linked to salad mix from Taylor Farms de Mexico, S. de R.L. de C.V., which sold food service salads to Olive Garden and Red Lobster. On August 12, 2013, that facility informed the FDA that the company has voluntarily suspended production and shipment of “any salad mix, leafy green, or salad mix components form its operations in Mexico to the United States.” They will not ship these products to the U.S. without the FDA’s approval. Public health officials are not sure if the illnesses in other states are linked to the Iowa and Nebraska outbreak. They are working with state and local officials to determine the source of the parasite. The symptoms of cyclosporiasis include watery and explosive diarrhea that can last for two months, loss of appetite, weight loss, fatigue, nausea, vomiting, and stomach cramps. It is treated with sulfa drugs. If you are experiencing these symptoms, please see your health care provider immediately.